The Boeing 787 Dreamliner is known as one of the world's most successful aircraft, even in its early stages. It's fuel efficient and clean, and built for sustainability. Engines and Systems: The Boeing 787 can be fitted with either the GE GenX engine or the Rolls Royce Trent 1000, both of which promise the best efficiency on the market for the engine class. The engine's bypass ratio of 10 means the engines are quieter, more fuel efficient and environmentally responsible. An advanced fly-by-wire system includes a wing that can change its own chamber in flight through an automatically adjusted trailing edge that moves up or down as needed for maximum efficiency. The ailerons automatically adjust, as well, for the most efficient position. Structure Design: The jet is 50% composite material, lessening the load and thereby making the 787 even more fuel efficient. The composite material also helps reduce maintenance costs. There's also a design improvement on the engine nacelle that creates a more laminar flow of air over the engine, reducing drag and increasing efficiency over similar aircraft. Finally, the 787 has smaller fairings with a simple pivot edge trailing flap system, allowing for less drag and an increase in performance. Avionics: Pilots that have flown Boeing aircraft before, such as the Boeing 777, will be familiar with the avionics. While Boeing worked to create a state-of-the-art system, it wanted to keep familiarity in focus so that aircrews will transition easily between current Boeing jets and the 787. With the latest advancements in onboard equipment, including dual Heads-Up Displays, extra-large MFDs, and two electronic flight bags, Dreamliner customers shouldn't have to add a thing to the cockpit. The 787-8 can hold between 210-250 passengers. When configured for cargo operations, the total cargo volume is 4,400 cubic feet. A typical cargo arrangement can hold 5 pallets, 12 LD-3 containers and allows for 402 cubic feet of bulk space. Just slightly larger than the 787-8, the 787-9 model can hold 250-290 passengers. When configured for cargo operations, the total cargo volume is 5,400 cubic feet. A typical cargo layout for the 787-9 will hold 6 pallets, 16 LD-3 containers and has 402 cubic feet of bulk space. 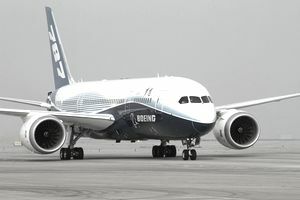 As of press time, Boeing had taken orders for 854 787-8 and 787-9 aircraft, an undeniably successful amount of orders. In 2012, Boeing delivered four 787 aircraft to Japan Airlines and 11 aircraft to ANA. Passengers who get to fly on the Dreamliner will be more comfortable, thanks to Smoother Ride Technology, which senses and neutralizes turbulence. LED lighting, large overhead bins, vaulted ceilings, cleaner air, and a lower cabin altitude should make airline customers happier and healthier. My favorite feature by far is the electronic lightening and darkening function on the new, larger windows. Passengers can block out the light as much or as little as they'd like, without losing the view -- brilliant!